Ask -Where in Delaware ? Hey there! Thanks for dropping by Delaware Social Media Network! Take a look around and grab the RSS feed to stay updated. See you around! Well this site is all about, asking questions about Social Media, and getting answers. So here we go. First off #ff is a shortened version of #FollowFriday, it saves some key strokes and room to allow you to add more mentions to your tweet. “What if you didn’t know who to follow on Twitter? Would you randomly start following people? Would you follow people you see mentioned by those you already follow? Most likely you would ask your friends for recommendations since you can trust that your friends will suggest people who are worth following. 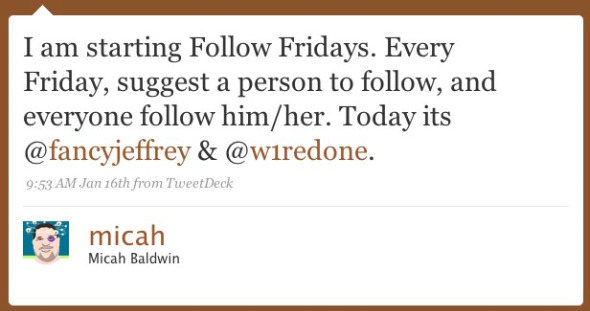 Which is exactly how FollowFriday began. The idea is to think of interesting people you already follow and recommend them to others. Mykl Roventine suggested the hashtag #followfriday, and a few friends (Chris Brogan, Erin Kotecki Vest, Aaron Brazell and Jim Kukral) helped spread the word. On the first FollowFriday, there were almost two #followfriday tweets per second at its peak. By Saturday morning, there was no trace of FollowFriday. A one-off fad, perhaps? 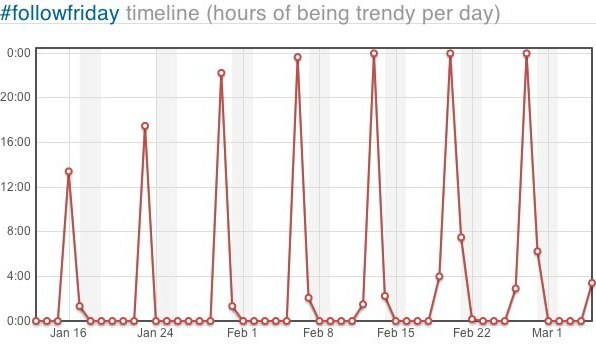 What’s interesting is not that #followfriday trends for the full Friday each Friday, but that the bottom of the spikes have begun to spread out. Meaning that #followfriday is beginning to spread into Thursdays and Saturdays, US time. In other words: #followfriday is international. 1. It’s easy. It takes little effort to send a tweet, something people do dozens of times a day. Recently, in Delaware, some people have started to add a brief explanation of why you should follow the tweeps in their #FollowFriday mentions. This helps others to know why they should follow them as well. Oh and one last thing, generally, if you are mentioned in a #FollwFriday tweet, it’s a courtesy to thank the person who mentioned you.